The Indians were searching high and low for a hit against Mets starter Matt Harvey on Saturday afternoon. When Cleveland finally did break through, the hits arrived in bunches, and the Tribe walked away with a 7-5 Interleague victory at Progressive Field. Harvey carried a perfect game into the fifth inning for New York, but the Indians struck for five runs off the right-hander before the end of the sixth. Jose Ramirez, Juan Uribe, Jason Kipnis, Mike Napoli and Yan Gomes each collected an RBI hit off Harvey, who struck out four, walked three and allowed six hits in the loss. "I guess the one thing I saw was where he was pounding the zone early, all of the sudden he started to get behind in some counts, left some balls up and didn't make the pitches he did early," Mets manager Terry Collins said. "I don't know why it's not the same." The win went to Cleveland starter Josh Tomlin, who logged five solid innings before exiting with a right leg cramp. The Indians' righty surrendered a leadoff home run to Curtis Granderson in the first inning, but then limited New York to just three more hits the rest of the way. Tomlin struck out six and walked none. "I wanted us to win so bad," Indians manager Terry Francona said, "because I wanted to come in here and brag about the way they played today. That was one of the [most fun] games, as far as sitting back and watching our guys play, as I've seen in a long time. I was really proud of them today." In the eighth inning, Yoenis Cespedes crushed a three-run homer off Indians reliever Bryan Shaw, who later allowed a solo shot to Neil Walker. It marked the second straight game in which both Cespedes and Walker went deep for the Mets. They each have three homers on the season. Leading off: Three pitches into his start, Tomlin surrendered a leadoff home run to Granderson. The blast was the 36th career leadoff shot for Granderson, who had seven last year for New York. Home runs have been a consistent issue for Tomlin, who has yielded dingers at a rate of 1.6 per nine innings over the past two seasons. "I threw a bad pitch to a good hitter, and he did what he's supposed to do with it," Tomlin said. "I've given up quite a few home runs in my career, so I knew at that point it was just bear down, and our guys have been swinging the bats pretty well, so keep it there and let them come back." Breaking through: Harvey cruised through the first 15 batters he faced before Ramirez slashed a pitch to deep left-center for a two-out, run-scoring double. Uribe followed with an RBI single to push Cleveland ahead, 2-1. His velocity down from early in the game, Harvey then fell apart in allowing six of the eight hitters he faced in the sixth inning to reach base. 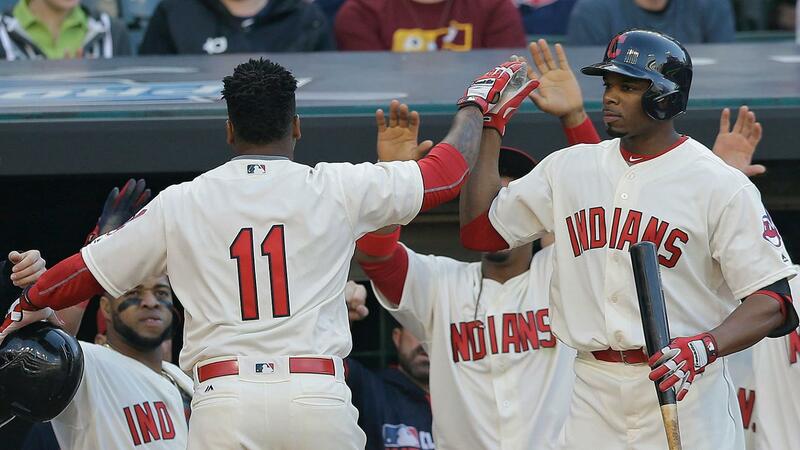 RBI hits from Kipnis, Napoli and Gomes highlighted the assault on Harvey, who also walked two batters in the inning. Left and Wright: Not only did Ramirez break up Harvey's no-hitter, but the utility man chalked up his first career outfield assist, too. David Wright sent a pitch from reliever Jeff Manship high off the left-field wall for a leadoff single in the sixth. Ramirez gathered the ball after the carom, spun and fired it to Kipnis, who applied a quick tag on Wright at second for the out. It was the third time in two games the Indians threw out a Mets runner on the bases. "I didn't think he had a chance," Lindor said of Ramirez's assist. "He threw the ball coming over me, I was like, 'I think he's got him.' As soon as I saw they called him out, I went crazy." Mets' rally comes up short: Cespedes' three-run shot in the eighth inning gave the Mets life, and Walker's solo homer enlivened the comeback. But after Shaw (nine earned runs allowed in 3 1/3 innings this season) gave way to Cleveland's closer, Cody Allen, the Mets were unable to dig their way completely out of what was once a six-run hole. "Obviously, he wasn't commanding very well," Francona said of Shaw. "First hitter bloops one in, and then he lost the plate, and then he tries to get ahead to Cespedes and he hit it good." After hitting just two home runs in their first eight games, the Mets have blasted seven over two games in Cleveland. They're the first team to touch the Indians for three or more in consecutive games since the Yankees did so three years ago. Mets: Steven Matz (0-1, 37.80 ERA) will look to turn things around both for him and his team when he faces the Indians at 1:10 p.m. ET in Sunday's series finale at Progressive Field. Matz could not escape the second inning of his season debut against the Marlins, giving up seven runs in total. Indians: Right-hander Corey Kluber (0-2, 4.85 ERA) heads into Sunday's game against the Mets in search of his first win of the season. Kluber spun a quality start on Tuesday, limiting the Rays to three runs over 7 2/3 innings, but the Tribe managed only one run of support in the loss. The Indians have scored just three total runs through his two outings.